DEPUTY Commander of the Kenyan Navy, Brigadier John Waweru had an unexpected reunion with a former colleague from the Royal Navy whom he last saw 27 years ago. 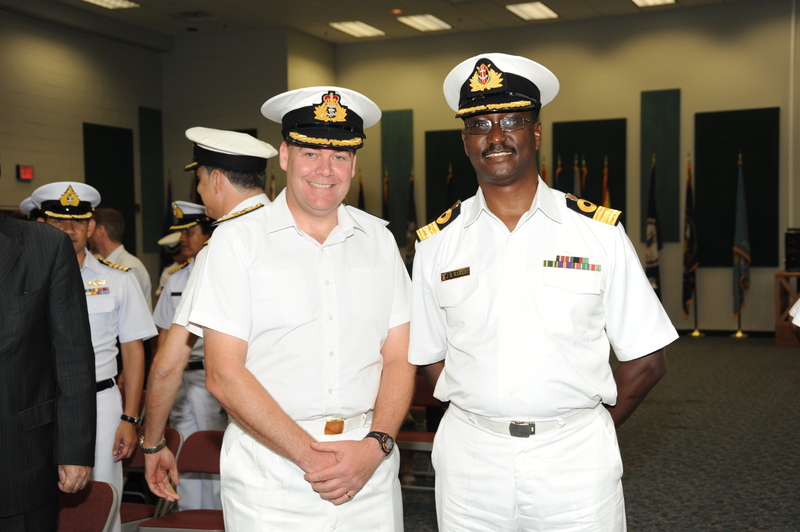 Brigadier Waweru was reunited with Commodore John Clink, Royal Navy, when he travelled to Bahrain to attend Combined Task Force (CTF) 150’s Change of Command ceremony. This major ceremonial event was held July 31 2011 during which Commodore Clink was installed as the new commander of CTF-150. The two senior naval officers last saw one another when they were young officer cadets in the same training class at the United Kingdom’s prestigious Britannia Royal Naval College. During his visit, Brigadier Waweru was able to witness first hand the work of Combined Task Force 150, which directs a group of ships currently made up by the UK, Australian and Pakistani navies. The primary role of Combined Task Force 150 is to conduct anti-terrorist, anti-drug smuggling and maritime security patrols in an area which covers nearly 2 million square miles of ocean. It is part of the wider Combined Maritime Forces mission, a 25-nation coalition based in Bahrain that tackles piracy, drug and weapons smuggling, humanitarian aid and other maritime security tasks.